Tsubaki sprockets are built from top-grade, heat-treated carbon steel to offer long wear life, resist abrasion, and withstand heavy shock loads. 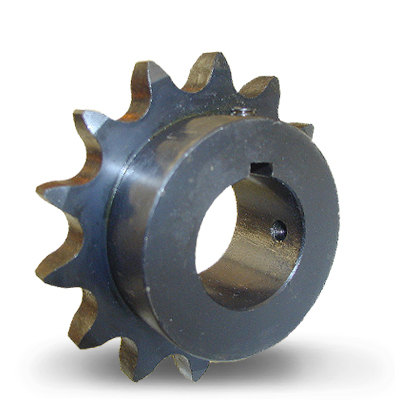 For extra corrosion resistance and food-grade applications, alloy and stainless steel sprockets are also available. You get longer service life and reliable performance, turn after turn, time after time. System performance highly depends on chain-sprocket interaction, which means your choice of sprockets can drive your operation’s success. Make the right and easy choice with sprockets from Tsubaki. Tsubaki offers both chain and sprocket manufacturing capabilities. When chains and sprockets articulate perfectly, you get long service life and reliable performance. That means long-term savings and real value for your operation. We offer complete line of standard and customized sprockets! Tsubaki aims for precision manufacturing. Seamless excellence from concept to market. TSUBAKI HAS THE LARGEST SPROCKET MANUFACTURING FACILITY IN CANADA!